When you’re looking to encourage and motivate people, you can’t go wrong with quotes from Tony Robbins. The author of five books and hundreds of videos and live seminars, Robbins has touched the lives of millions. Here at Motivating Systems, we’re big fans of Robbins’ quest to promote a positive mindset. In fact, our core mission is to assist organizations in developing an effective environment. We believe that a positive workplace is a healthy, more efficient workplace, and we develop systems that help organizations motivate people to do their best. We’ve put together a collection of Tony Robbins quotes that have been shared with our team and posted around the office. In the interest of sharing with others, we’ve decided to make this available to everyone. Here’s a collection of some of our favorite Tony Robbins quotes (infographic style) for you to download, print, and share as you are motivated to do. Do you want the quotes as single page signs? Great idea! We’ve added those. 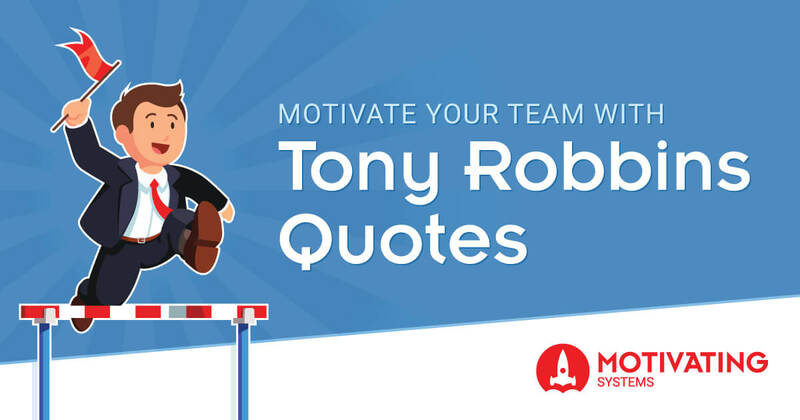 You can now download these Tony Robbins quotes as a printable PDF with one quote per page. Remember, we encourage you to share this with others. Use the share buttons below ▼.